If you’ve been attracted to read this article, you’re probably one of the growing number of recruiters who’s concluded that their business needs a social media strategy. I’ve worked intensively on developing and deploying social media strategies for the last 36 months. Initially to drive interest in Social-Hire… and increasingly to drive interest in the businesses of the recruiting clients we serve. So I thought it’d be a great way of helping our recruiter followers and contacts if I put into words (and an infographic for your wall!) some of the key things to act upon when drawing up and implementing your social media strategy. With that in mind, grab yourself a coffee, take a deep breath and think through all of the following before you begin putting your social media strategy into place. Who do you want to reach with your social presence? Potential candidates? Potential recruiting clients? What sectors are you targeting, in what geographies and at what levels of seniority? Do you hire for niche markets… and if so can they really all be served by one set of social profiles? Before you do anything, these are the questions you need to ask yourself. In order for your strategy to be effective, you must have a clear and thorough understanding of who you want to reach so that you can develop your strategy accordingly. Knowing this information is essential to sourcing and creating content for your profiles and will help you identify the social media platforms your target audience are most likely to be using. Looking ahead, what would constitute success for your team’s social media presence? Increased candidate traffic to your careers pages? Uploads of resumes to your ATS? Requests for a call to discuss hiring challenges that potential future clients are facing? The answer to these questions will influence the tone of your social profiles, the content you share, and the calls to action you introduce in your updates. Consider how following your social profiles will benefit a member of your target audience. What information, insights, data, interviews, humour, content would a typical member value receiving each day? Define this very clearly. Then, make your social profiles all about delivering this value, from the bio that appears on your profile page to the content that you deliver. If your target audience comprises job seekers in a specialised industry, then sharing targeted content that will help them land a job or further their career in that field would be valuable. So too is specialist content from niche publications that your audience may not have come across before. Chances are, you don’t have as big an audience or following as you would like to have for your company. You can grow your audience by building relationships with non-competing businesses, organisations and individuals who reach the very audiences that you would like to reach. Figure out who they are – focusing particularly on those who have a track record of regularly re-sharing other people’s social posts – by brainstorming with colleagues and researching your demographics’ interests. Go out of your way to share and comment on these influencers’ updates. In no time, you will start to see some of them reciprocating which will allow your own updates to be seen by their sizeable followings and dramatically increase your reach and visibility. Typically, only 20 percent of a social site’s user base is active enough to see your updates and engage with your brand. It’s therefore essential that you devise tactics for each social site to ensure that you’ve isolated those users who are both relevant for your business and active on the site. Otherwise you risk 80%+ of your efforts being entirely in vain as you try to engage with accounts whose owners are simply never going to be aware of your attempts at engagement or see your posts. Pay attention to what people in your target audience are saying on social media and the feedback you receive. Look out for mentions, comments, shares of your website content by others, etc. As well as direct feedback like comments, also pay attention to indirect feedback such as click data on your updates and resulting website traffic behavior when prospective candidates end up on your company site. Facebook business pages, for instance, provide page insights that allow you to review the popularity of everything you post at a glance. Make note of the content with the highest engagement rate which measures the amount of people reached who then clicked, liked, commented on or shared your post. Do likewise on LinkedIn and on Twitter. Doing this will help you source and create stronger content in the future that will engage your audience more effectively. 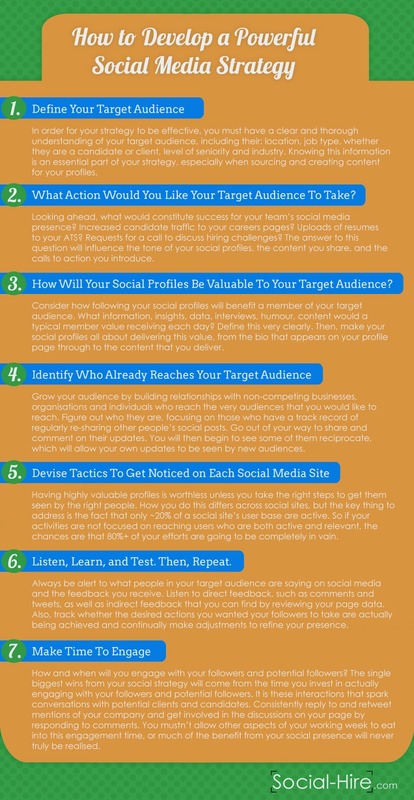 These are the steps that ensure you become a genuinely candidate and client focused business on social media. In addition, track whether the desired actions you wanted your followers to take are actually being achieved and continually make adjustments to refine your presence. A company can have the most popular Facebook page by posting comics, memes and videos, but that would likely cause job seekers to see the profile as a source of entertainment rather than a resource to help them land a new job. How and when will you engage with your followers and potential followers? Have you set aside the necessary resources / hours to ensure you don’t compromise on engaging with your audience? The reason this is so important is because the single biggest wins from your social strategy will come from the time you invest in engaging with your current and potential followers. These interactions spark conversations with potential clients or candidates, and these conversations will lead to you having a sales meeting or representing a candidate. However, this is also the element of your social workflow that is most at risk of being compromised when other demands in the business are competing for your time. You mustn’t allow other aspects of your working week to eat into this engagement time, or much of the benefit from your social presence will never truly be realised. So there you have it – some pointers I hope you will find extremely useful in helping you to take your first steps in developing and implementing a powerful social media strategy for your business. If you’d like more help, or to find out how Social-Hire can support your social media efforts by having some of this work outsourced to us, feel free to set up a time for a one-on-one consultation. And for those of you who’d like something to pin on your wall to help remind you of these pointers, here’s a more graphical format you’re welcome to use and share as you see fit!